The understanding of Greatness forms the foundation for everything we do at Dawning Truth. We have spent many years researching the key differentiators that allow a person or business to attain Greatness. This included an extensive study of 42 of the Greatest individuals ever to walk the face of the earth. The results of this study are included in our book “The Inner Secrets of Greatness”. What makes a Person or Business Great? Let’s briefly explore these principles. 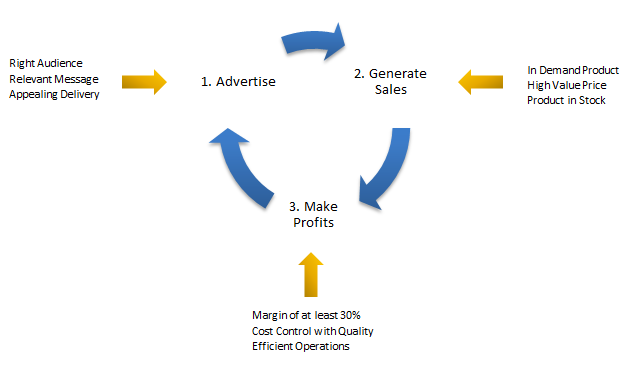 The easiest way to understand the Growth Loop principle is with an example. 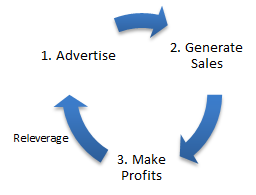 In the diagram below we outline a simple business growth loop. In fact it is the growth loop that many successful businesses use. Firstly they advertise their products or services. This generates new customers and sales. The sales generated lead to profits. The profits are then redirected (Or Releveraged) into further advertising. The additional advertising leads to even more sales, which generates even more profits, which enable even more advertising. This virtuous cycle continues, leading to ever greater profits. Granted this is a simplification of the typical business process, but in essence this is what many successful businesses do. Similarly, growth loops can be applied to all areas of life and all areas of business. You could use a growth loop to enhance your career by constantly releveraging your career successes and business relationships to enhance your performance. You could releverage your existing customer relationships to grow your sales revenues. You could releverage your existing knowledge to discover new insights and wisdom. The key idea is to create a virtuous cycle where success is used to create additional success. A Best Practice is a general rule, which enables a person or organisation to consistently achieve a desired result. For instance, in the area of Sales, it is a Best Practice to develop strong relationships with your customers. This rule has been proven to be effective by many successful sales encounters over many years. In the area of being a Personal Assistant, it is a best practice to understand your bosses business, in order to ensure that you are effective in screening calls and setting up meetings. This practice is followed by the best PA’s in the business. Best practices are typically discovered through trial and error or through observing what works for others. They can also be taught in training courses, such as the courses Dawning Truth provide. This is the key to making a growth loop work. Let’s look at our Growth Loop again to understand how to apply this principle. In the above diagram we have included Best Practices which could be applied at each step of our Growth Loop. In a real business, these practices would be adjusted to suit the specific circumstances. Other practices would also be applied. Firstly we begin with the activity of Advertising the business. In this area the following Best Practices apply. Present the message in a compelling and appealing way, so that your audience will have a desire to acquire your product. These practices have been found to be highly effective in getting an audience to purchase a product. Similarly you would apply the best practices for Generating sales and Making Profits. Best Practices make your Growth Loop more effective, by ensuring that each step of the loop is effective and produces the desired results. Business issues and business failure are often caused by the ineffective application of Growth Loops and Best Practices. For instance, if you do not apply Best Practices to your Growth Loops, you may find that the loop breaks, and the virtuous cycle can’t be completed. From our example: You are effective at getting customers to want to purchase your product, but do not have the product in stock, so you are unable to Generate Sales. This in turn means you are unable to Make Profits from your sales. Which means you are unable to releverage your profits for further Advertising. Business initiatives such as cost cutting, or growth drives often fail due to a misunderstanding of Growth Loops. Either the growth loop of the business is not understood, and hence no releveraging takes place, or the growth loop itself is broken, and the virtuous cycle can not be completed. Dawning Truth can help you to fix broken Growth Loops and to create additional Growth Loops in your business with our consulting services. In conclusion, Dawning Truth utilises proven Principles of Greatness and Best Practices in everything we do. We sincerely believe that this is the only way to ensure that you get the maximum value from our consulting services and training courses. If you have any questions about our approach, please contact us using our contact form.